If police are meant to protect and serve, Mountain View officers took service to a whole new level on Friday. Ian Cull reports. If police are meant to protect and serve, Mountain View officers took service to a whole new level on Friday. Sgt. Magee emerged from police headquarters with an object wrapped in a cloth fabric, tied with a bow. Inside was a photo album. He found that album back in August under a bridge at a homeless camp. He thought it looked special, so he and the department tried to track down its owners. Their posts on social media asking for help were shared thousands of times. Officers cross referenced names on the back of the photos and even used ancestry.com. Finally, they found a match. “You see [the people in the photos] when they’re young, and now you're going to see them later in life," Sgt. Magee said. Their investigation landed them at a Los Gatos retirement home. 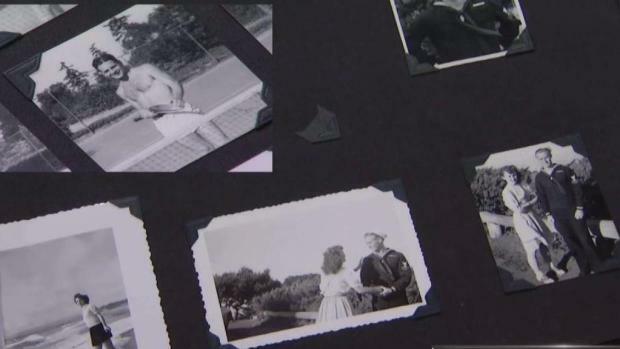 Police in Mountain View are searching for the owner of an album containing World War II-era photographs that was found near a homeless encampment Monday. Ian Cull reports. Two sisters, both in their 90s, came through a door to greet Sgt. Magee, Officer Mike Taber and community Service Officer Jodie Pierce. Magee presented the album. The sisters smiled. It’s the first time they’ve seen it in more than 35 years. "I'm amazed at the shape it's in," said Janice Anne Duncan. "It's like meeting an old friend." She and her sister Nancy Rose made the album in their 20s. They can't recall how it was lost. Friday, they were just happy to have it back. Community Service Officer Jodie Pierce was instrumental in tracking them down. She said it was difficult because the sisters’ maiden name was Jacobs in the pictures. The officers spent three months searching for this moment. "We all sort of became part of their history, by looking at the photos and just became more and more intrigued, by who they were and what was going on in their life in that time," Pierce said. Janine recalls one man who appears in many of the photos as Chuck, a navy sailor. Chuck was Janice’s love back when she made the album. "Chuck and I were fast friends," Duncan said. "He used to go to the cocktail parties at Mills College." The stories continue with each turn of the page, as if they’re seeing their past for the first time. There was the vacation to Yosemite. A possible high school reunion. "It’s all yours now," Magee said to the sisters. It was never just a photo album found under a bridge. It's a piece of their family history, now back in their hands. This is quite a story. A WWII era photo album was found by @MountainViewPD in August at a homeless encampment. After a nationwide search, they finally found the owners and delivered it today.